The area known as the Caucasus is an ethnic fruit cake that makes Belgium look positively integrated. In Georgia there are Georgians aplenty - Caucasians, in the true sense of the word. 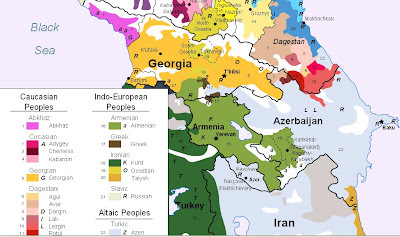 There are also Ossetians (Iranian), Russians (Slavs), Armenians, pockets of Greeks, Abkhaz and a leavening of Turkic Azeris. Around them are Turkmen, Dagar, Lak, Agul, Lezgin, Dargin, Rutul, Cherkess, Adygey, Kabardin, Avar, Nogay, Kumyk, Karachay, Balkar, Kurd, Ingush, Tsakhur, Tabarsaran, Kalmyk and Chechen peoples, all with their own language and all ready to set up their own micro-state as soon as they collect enough AK47s and the BBC pronunciation unit has worked out how to say the President's name. For some years I've taken the mickey out of American housebuilding techniques. US suburban homes are typically closely engineered timber frame and plywood structures with a wodge of insulation and cladding that may also be timber and a roof that may be timber shingles. It will withstand most things except American weather, which causes involuntary relocation and may be dangerous to those of a witchical persuasion. In contrast to British homes solidly constructed of clay bricks, blockwork and Portland cement mortar with heavy concrete roof tiles which won't shift in a breeze and that leaves witches intact. So no prizes for working out that US homes, from the nation that reportedly produces 25% of the world's CO2, are rather more environmentally friendly. Portland cement manufacture is the world's second greatest CO2 emitter, after energy production, and before transport and air travel. Clay bricks need firing at high temperature. The average new British home will have been responsible for many, many tonnes of CO2 having been emitted in its making. Timber, in contrast, locks in atmospheric CO2 for as long as it stays intact. A medium tree will have locked in about 4 tonnes of CO2. A house built of timber is therefore very environmentally friendly - it is, quite literally, carbon capture and storage that you can live in. And frame and truss design that maximises resource use and minimises waste as external benefits to price competitiveness (though not tornado proofing) is also a good eco-thing. The downside to US housing is that it's built scores of miles from employment hubs in suburbs that stretch to the far horizon, so they have to use gallons of petrol every day getting to work. But you can't have everything. And because they're so spread out, when one is spared by tornadoes only to catch fire, it doesn't matter much, whereas our dense housing tightly packed around town and city centres needs to be a bit more fireproof, hence the party wall requirements brought in after a small blaze in 1666. The difference in approach to house construction is also psychological. Our homes are mini castles, looking back to the Norman keep and the solidity of ashlar and mortar. American homes are on the frontier, log cabins to provide temporary shelter as one moves on. We are fixed, they are mutable. They're going somewhere, while we've got there already. The implied message is that Russia needs and deserves a strong leader. With this, the past mutes smoothly into the present. The man who had spent eight years in the Gulag run by the KGB detects in Putin, who is still proud of his outfit, the needed strong leader. Accordingly, Putin is the protector who shields the land from “Western encroachment”, one who assumes the burden of keeping Russia powerful in the world and in order at home. Appropriately, in 2007, celebrating the Day of Russia, the Putin-system formally expressed its gratitude for the endorsement to Solzhenitsyn by awarding him the highest civilian decoration Russia has. The physical death of AIS nudges one to pen something as laudatory as our conventions demand. Yet, the truly great deserve more than homilies: by definition, their stature rests on a firm fundament. That pedestal will withstand all aspects of the truth and its contradictions. Solzhenitsyn was a great man. However, as a man, he cannot be expected to have been free of fault. Obituaries prompt those who remember publicly to lie piously. AIS is culturally and politically too significant to require cheap homage. In view of his achievements, he deserves more than a ceremonial laudation painted in colors made more vivid than those of the reality he had shaped. 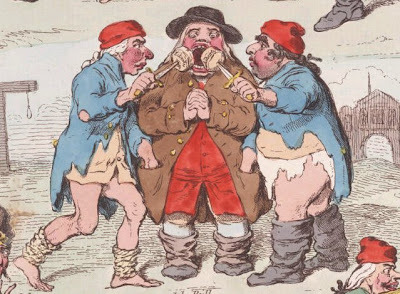 Newmania highlights a piece in the Grauniad describing how the French are starting to take their breeches off again. Beware. The last time they did this, they decapitated their sovereign and spawned a monster who subjugated half Europe; it was left to the Brits, who wisely kept their breeches on, to sort the whole mess out. But it wasn’t the Captain that sank the Titanic – a ship they claimed was unsinkable - it was the iceberg. The best way to avoid disaster is to manage your way around the problem. And speaking as someone who’s served on a ship and in a leadership, the best person to steer us through is a Captain with the experience to navigate through these stormy financial global seas. For me, it’s all about setting the right course. That’s why I’ve always favoured policy over personality and why I believe Gordon’s the right captain. Thus demonstrating why he was serving Gin in the passenger lounge and not piloting the vessel on the bridge. The Captain is responsible at all times for maintaining an adequate lookout and for ensuring that his vessel proceeds at a safe speed and on a safe course given the prevailing circumstances and conditions. It's no good blaming it on the iceberg. It's not just about setting the right course, but knowing when to 'stand on' and when to 'give way'. And a Captain who concentrates on steering the ship without noticing the hull is holed and the bilges are filling with water isn't worth his ticket. If McLoon is a Captain, then he's Captain Queeg. Apologies for two boaty posts in a week. Reliance on financial services has at times made the UK economy look like a giant hedge fund and made us - both citizens and government - predisposed to spend the money without thinking too hard about where it came from or how it was being earned. Had we looked more inquisitively we would have seen that the financial sector has grown bigger than the world economy needed it to be, and as a result was filling its days inventing ever more exotic products that it claimed made markets more efficient and added to economic growth but in fact contributed little to either. Finance had become a machine to slice up and repackage old wealth for the fees it could earn, rather than a service to help others create new wealth. The consequences of that have now become apparent. When finance slows there is not enough to fall back on. Economics has run ahead of politics across the world. Finance and markets and business have become global and respond to global pressures. Politics is still nation-based, local and unable properly to respond to the demands of the new world order. This is bad news because the actions of politicians - and it must be said the wishes of voters they represent - threaten to prolong the crisis. Nowhere is this more obvious than in the seemingly endless succession of bank bailouts and rescues. The financial sector needs to go back to basics, renounce its addiction to gambling and rediscover its purpose as a facilitator of economic growth in others. But that means it will have to be smaller and less well paid. Getting back on that even keel means letting some of those banks go bust - but the politicians are too scared to do it. It will happen in the end, though, because ultimately there is no alternative. The economy will slow further as banks withdraw finance from other productive parts of the economy, commercial property companies go bust, speculative office blocks stand empty, shopping malls get boarded up and individuals struggle to save more to relieve their debt burdens. Fair dos. Let's get the pain over with, then. Let a bank or two break, let the others pick up the pieces. I knew Brown should never have bailed Northern Crock out. So no more tax bail-outs from the UK - let them go begging to the US if they want to. If Polly Toynbee reads the hundreds of comments that her recent puff piece in CiF attracted she won't be a happy bunny. Just as Polly has spurned last year's dour lover in favour of this year's toyboy, Guardian readers have fallen out of love with Polly. The sheer vindictiveness of the left is a wonder to behold. Here at Raedwald Towers we've long known that Polly inhabited some strange parallel universe unconnected with our reality, but it seems the comrades are only just working this out. The overwhelming opinion of the Guardianistas now is that Polly is a waste of ink and newsprint. Perhaps she'll start billing herself as 'Britain's most reviled columnist' and make a USP out of it, but I doubt it. Still, there's always her Tuscan villa to jet off to. I've no doubt that Polly's carbon conscience compels her to send twenty quid by Paypal to some bloke in Africa every time she burns a ton of aviation kerosene, and in return the bloke will tell her that thirty trees have been planted. Africa must be as lush as the Amazon these days with all those millions of new carbon-offset trees. Polly won't mind a bit about the intrusive questions, searches and baggage restrictions, the queues or the sullen rudeness of the hordes of new jobsworths that Zanu Labour has put into fluorescent waistcoats; with Blairite Brownite Milibandian zeal she will already have deposited her fingerprints, iris scan and DNA with the police, volunteered for full body-cavity searches and will carry a card indemnifying the police should they carelessly shoot her dead for losing her boarding pass. As her aircraft streaks into London's clouded skies she can recline content in the knowledge that Zanu Labour have made Britain a happier and safer place. And Italy has done its best to make Polly and ZNL's other Tuscanophile apparatchiks feel right at home as they start their holidays. The twelve year-old gypsies have already been fingerprinted and rounded up into ghettoes into which Italians are encouraged to throw petrol bombs; stinking refuse is piling up in the squares and piazzas, Novara has banned gatherings of three or more people at any time in an echo of a 1920 Fascist edict, and armed troops are patrolling the streets across Italy as Berlusconi tightens his media grip and is making moves to ban You Tube. And Polly will bliss-out in Chiantishire as she slumps like a block of melting lard on her sunbed, for this is her very Labour vision for Britain; if only we saw David as she sees him, not as a weird looking wonk with a bumfluff upper lip, but as a young Adonis, an Arthur pulling the sword of socialist progress from the stone. The first indication that the dreadlocked crusty and grunge brigade on their way to 'blockade' Kingsnorth yesterday were going terribly wrong came from Southeastern Trains. Protesters behung with tents and bedrolls were turning up at stations across the south-east and buying tickets to Ashford in Kent. Kingsnorth is a hamlet on the delightful Romney Marsh line that takes one to the difficult port of Rye (yes, reader, I have piloted the Stone Channel on a falling neap tide), somewhere north of Ham and a little south of Ashford. It has many attractions, but a coal-fired power station is not amongst them. Confused phone calls were made, and realisation dawned on ticket office staff that the crusties wanted Grain, not Ashford. For the Kingsnorth that is the coal fired power station is on the Medway estuary. I could not but suspect that there had been a little disinformation spread on the protesters' websites. Indeed, Medway Ports were way ahead of the game at the beginning of July when they were picking up a plot from the crusties to block the cooling water intakes with rafts. A notice to mariners was issued on the 10th giving notice that a boom was being strung around the intakes - as I've marked on my chart below. Apart from the sheer stupidity of floating rafts on a busy waterway - if Raedwald should hit a semi-submerged raft she'll be getting a crest of dirty blond dreads for the masthead, I promise - the crusties are putting themselves in some danger. 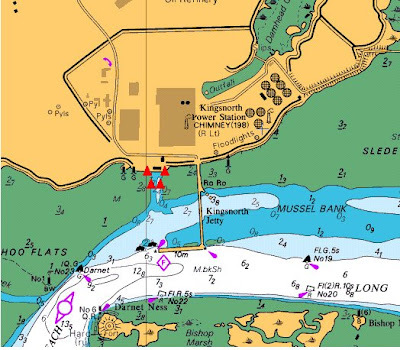 The Medway tidal currents are strong, and the area inside the jetty and especially around the water intakes is somewhere to be avoided even in a heavy boat with a powerful engine. 'Ministers rally to support Brown'. What? Three cabinet ministers have rallied to the prime minister's defence, insisting he is the right man for the job. The public is right to feel aggrieved that Zanu Labour is covertly using taxpayers' cash to sponsor programmes billed as documentaries rather than propaganda. The Telegraph reports this morning that Labour has put £800k of our money into a show called Beat: Life on the street that purports to be a documentary, and that it gets editorial control over the message. Co-operation with programme makers is nothing new; from Warship to A life of grime the cameras have been allowed to follow the activities of branches of government. Most of these sort of programmes have positive results, not because they are propaganda but because they have a discernible independent 'voice' and don't set out to be unsympathetic. But they succeed largely because they attract audiences. I've never seen Beat and wouldn't watch it if I noticed it. And I suspect none of the networks would buy it if it were priced commercially, but Labour's subsidy has allowed it to be flogged so cheaply that at least one has taken it. And this distortion is perhaps the real danger; if Labour is distorting the market in favour of its own propaganda, it's also crowding-out other documentary work that may not be so sympathetic. And this is where sponsorship veers into censorship. The only justification for state economic intervention is the failure of markets. The UK's documentary programme making market is not failing. There is no economic justification for this economic interference. It is the use of tax money for party propaganda, pure and simple. The practice is loathsome, repugnant, sleazy and dangerous. And it must cease forthwith.